This is the second part of the index for the 'longer stories' series, this one covering 1930 to the apparent end of it in 1933. This index was compiled based on the Cincinnati Enquirer starting in 1930, then in January 1931 I had to switch to the Miami News when the microfilmer of the Enquirer decided that Sunday magazines weren't worth the time to photograph. The Miami News dropped the cover in July of that year, so then I switched to the Minneapolis Tribune. The Tribune got me to the apparent end of the series, which I was able to confirm in a second paper. 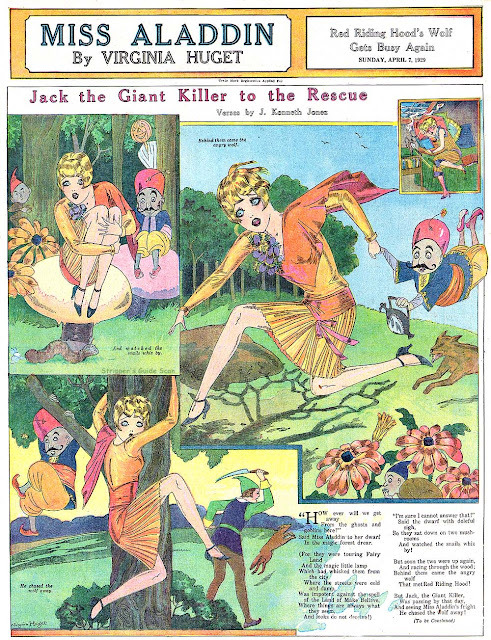 The syndicate, which had been International Feature Service, changed to King Features Syndicate in January 1932. I believe this is when IFS was phased out as a separate syndication company for Hearst. 11/23/30 Barbara's Bad Man (verses by Berton Braley) John Held Jr.
11/30/30 Barbara's Bad Man (verses by Berton Braley) John Held Jr.
12/7/30 Barbara's Bad Man (verses by Berton Braley) John Held Jr.
12/14/30 Barbara's Bad Man (verses by Berton Braley) John Held Jr.
12/21/30 Barbara's Bad Man (verses by Berton Braley) John Held Jr.
12/28/30 Barbara's Bad Man (verses by Berton Braley) John Held Jr.
1/4/31 Barbara's Bad Man (verses by Berton Braley) John Held Jr.
1/11/31 Barbara's Bad Man (verses by Berton Braley) John Held Jr.
1/18/31 Barbara's Bad Man (verses by Berton Braley) John Held Jr.
1/25/31 Barbara's Bad Man (verses by Berton Braley) John Held Jr.
2/1/31 Barbara's Bad Man (verses by Berton Braley) John Held Jr.
2/8/31 Barbara's Bad Man (verses by Berton Braley) John Held Jr.
2/15/31 Barbara's Bad Man (verses by Berton Braley) John Held Jr.
2/22/31 Barbara's Bad Man (verses by Berton Braley) John Held Jr.
3/1/31 Barbara's Bad Man (verses by Berton Braley) John Held Jr.
3/8/31 Margy John Held Jr.
3/15/31 Margy John Held Jr.
3/22/31 Margy John Held Jr.
3/29/31 Margy John Held Jr.
4/5/31 Margy John Held Jr.
4/12/31 Margy John Held Jr.
4/19/31 Margy John Held Jr.
4/26/31 Margy John Held Jr.
5/3/31 Margy John Held Jr.
5/10/31 Margy John Held Jr.
5/17/31 Margy John Held Jr.
5/24/31 Margy John Held Jr.
5/31/31 Margy John Held Jr.
6/7/31 Margy John Held Jr.
6/14/31 Margy John Held Jr.
6/21/31 Margy John Held Jr.
8/30/31 Margy John Held Jr.
9/6/31 Margy John Held Jr.
9/13/31 Margy John Held Jr.
9/20/31 Margy John Held Jr.
9/27/31 Margy John Held Jr.
10/4/31 Margy John Held Jr.
10/11/31 Margy John Held Jr.
10/18/31 Margy John Held Jr.
10/25/31 Margy John Held Jr.
11/1/31 Margy John Held Jr.
11/8/31 Margy John Held Jr.
11/15/31 Margy John Held Jr.
11/22/31 Margy John Held Jr.
11/29/31 Margy John Held Jr.
12/6/31 Margy John Held Jr.
12/13/31 Margy John Held Jr.
12/20/31 Margy John Held Jr.
12/27/31 Margy John Held Jr.
1/4/32 Margy John Held Jr.
1/11/32 Margy John Held Jr.
1/17/32 Margy John Held Jr.
1/24/32 Margy John Held Jr.
1/31/32 Margy John Held Jr.
6/5/32 Runaway Red-Head John Held Jr.
6/12/32 Runaway Red-Head John Held Jr.
6/19/32 Runaway Red-Head John Held Jr.
6/26/32 Runaway Red-Head John Held Jr.
7/3/32 Runaway Red-Head John Held Jr.
7/10/32 Runaway Red-Head John Held Jr.
7/17/32 Runaway Red-Head John Held Jr.
7/24/32 Runaway Red-Head John Held Jr.
7/31/32 Runaway Red-Head John Held Jr.
8/7/32 Runaway Red-Head John Held Jr.
10/23/32 Margy of the Movies John Held Jr.
10/30/32 Margy of the Movies John Held Jr.
11/6/32 Margy of the Movies John Held Jr.
11/13/32 Margy of the Movies John Held Jr.
11/20/32 Margy of the Movies John Held Jr.
11/27/32 Margy of the Movies John Held Jr.
Our next series of magazine covers is indexed starting in July 1926, premiering with the very long Gloria - The American Girl series by Penrhyn Stanlaws. While no subsequent cover series would rival Gloria in length, my search for an identity of this syndicate offering leads me to call it the 'long stories' series. The syndicate was originally King Features Syndicate, but changed to International Feature Service in early 1929 for some reason. This change happened in the middle of a story, so I don't think there's any chance that I somehow conflated two separate series. If you look back at part 5 of this index series, you'll think that today's series is merely a continuation of the so-called 'romantic cover series', since the dates mesh perfectly. However, I do have samples in my collection of Gloria - The American Girl running earlier than this (back to 1925), so I think I have just not been successful in tracking this series back to its true origin. I have found the early Gloria series running in the San Francisco Call, which is not, as far as I know, available online yet. One addditonal note; if my inventory doesn't lie, there seems to have been an earlier series of Nell Brinkley's Pretty Polly - I show one from January 1927 somewhere in my collection. Or I mistyped? We'll cover this series through the end of 1929 today, and pick up the balance of the series tomorrow. I tracked this series through the end of today's post in the Minneapolis Tribune. 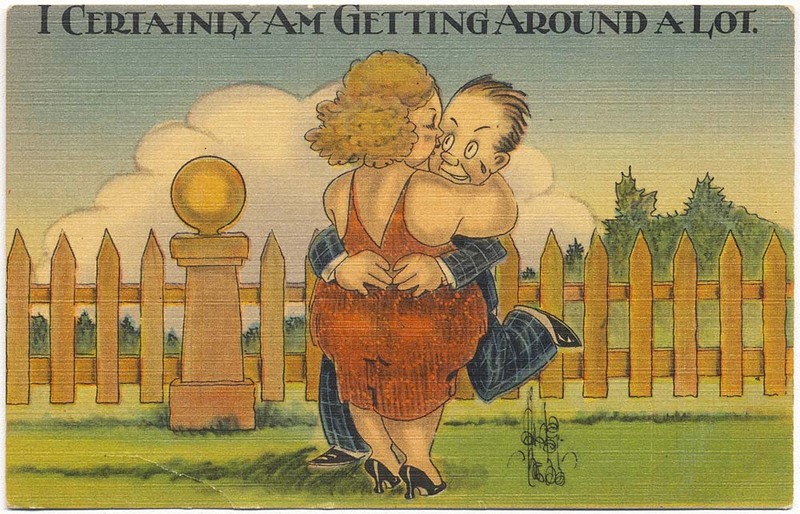 2/20/27 Peggy's Progress John Held Jr.
5/8/27 Sentimental Sally John Held Jr.
5/15/27 Sentimental Sally John Held Jr.
5/22/27 Sentimental Sally John Held Jr.
5/29/27 Sentimental Sally John Held Jr.
6/5/27 Sentimental Sally John Held Jr.
6/12/27 Sentimental Sally John Held Jr.
6/19/27 Sentimental Sally John Held Jr.
6/26/27 Sentimental Sally John Held Jr.
7/3/27 Sentimental Sally John Held Jr.
7/10/27 Sentimental Sally John Held Jr.
7/17/27 Sentimental Sally John Held Jr.
7/24/27 Sentimental Sally John Held Jr.
7/31/27 Sentimental Sally John Held Jr.
8/7/27 Sentimental Sally John Held Jr.
8/14/27 Sentimental Sally John Held Jr.
8/21/27 Sentimental Sally John Held Jr.
8/28/27 Sentimental Sally John Held Jr.
9/4/27 Sentimental Sally John Held Jr.
9/11/27 Sentimental Sally John Held Jr.
9/18/27 Sentimental Sally John Held Jr.
9/25/27 Sentimental Sally John Held Jr.
10/2/27 Sentimental Sally John Held Jr.
10/9/27 Sentimental Sally John Held Jr.
10/16/27 Sentimental Sally John Held Jr.
10/23/27 Sentimental Sally John Held Jr.
10/30/27 Rah-Rah Rosalie John Held Jr.
11/6/27 Rah-Rah Rosalie John Held Jr.
11/13/27 Rah-Rah Rosalie John Held Jr.
11/20/27 Rah-Rah Rosalie John Held Jr.
11/27/27 Rah-Rah Rosalie John Held Jr.
12/4/27 Rah-Rah Rosalie John Held Jr.
12/11/27 Rah-Rah Rosalie John Held Jr.
12/18/27 Rah-Rah Rosalie John Held Jr.
12/25/27 Rah-Rah Rosalie John Held Jr.
1/1/28 Rah-Rah Rosalie John Held Jr.
1/8/28 Rah-Rah Rosalie John Held Jr.
1/15/28 Rah-Rah Rosalie John Held Jr.
1/22/28 Rah-Rah Rosalie John Held Jr.
1/29/28 Rah-Rah Rosalie John Held Jr.
2/5/28 Rah-Rah Rosalie John Held Jr.
2/12/28 Rah-Rah Rosalie John Held Jr.
2/19/28 Rah-Rah Rosalie John Held Jr.
2/26/28 Rah-Rah Rosalie John Held Jr.
6/30/29 Rosalie Goes Rural John Held Jr.
7/7/29 Rosalie Goes Rural John Held Jr. 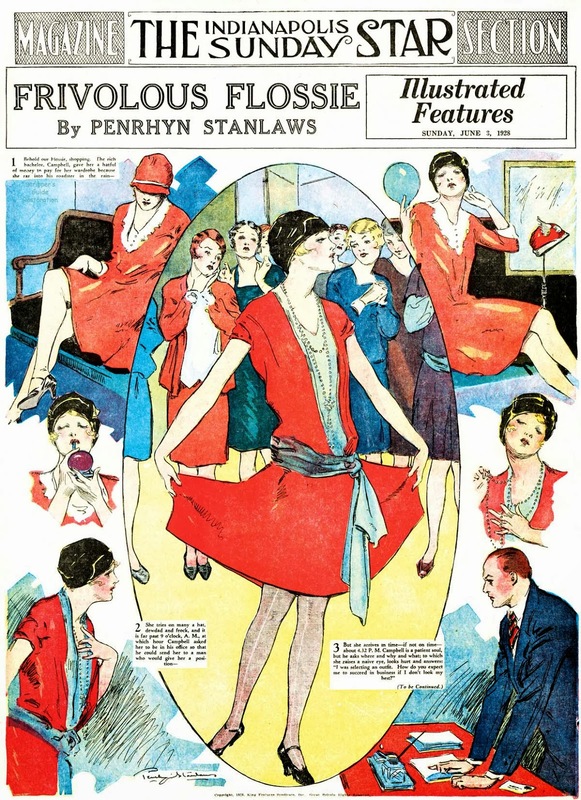 It turns out in my magazine cover research that in 1921 you could get your American Weekly Hearst covers in two flavors: one with the masthead with which we're familiar, or one with no masthead at all and copyrighted by International Feature Service. 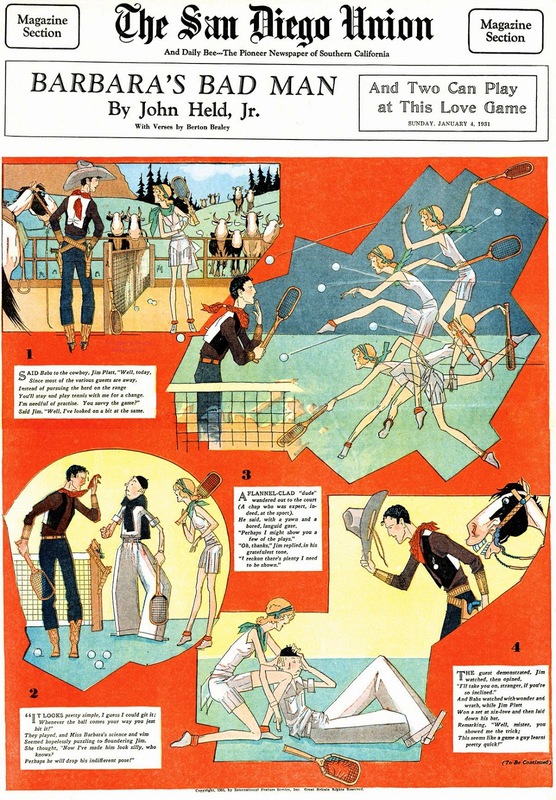 That practice seems to have halted in mid-August 1921, when the Dan Smith cover series was inaugurated and took over for the International Feature Service-branded American Weekly. However, it wasn't quite that simple. It seems that you could choose another new (?) series, also syndicated by IFS, that instead of Dan Smith covers offered what I call the 'romantic cover' option. This series featured lots of pretty girls as is typical of the Hearst covers, but these ones are focused on romance. In other words, looking to please the female audience more than the male. I began tracking this series in the Butte Miner, where due to some slight crossover with the Dan Smith series at the beginning I believe that the Miner runs their covers a week later than intended. 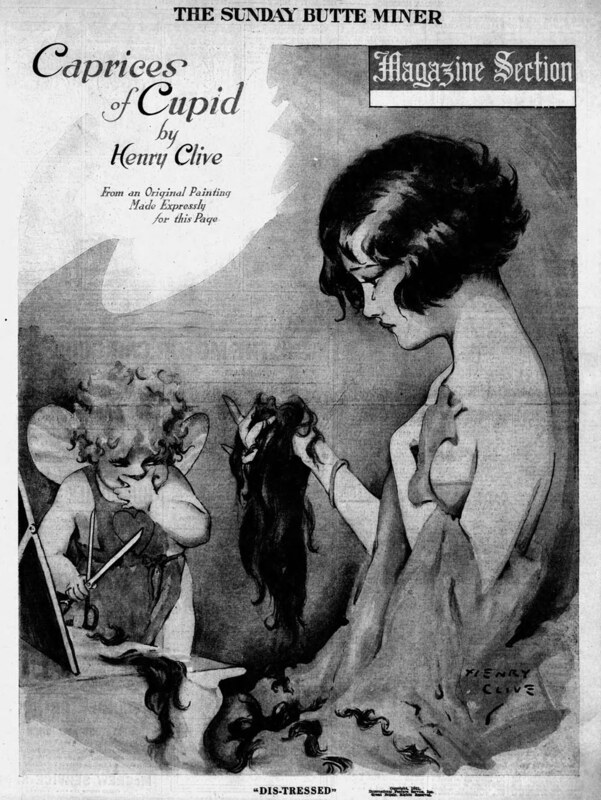 The series runs in the Miner through the end of 1923, after which I switched to the Minneapolis Tribune, filling in a long unavailable section of that from the Tampa Tribune. The Minneapolis Tribune stopped using this series in June 1926, and I can find no other paper that used it any later.